Hello, friend, it IS I, Marc Hershon, your host and adorable Lapso Apso for our sesquicentennial installment – that’s Epi150 to you and me – of Succotash, the Comedy Soundcast Soundcast. It’s also the 6th anniversary of this show being on the web! This particular listening experience is a Succotash "Chatisode", and features third time returning special guest Jordan Brady! Jordan has just started galavanting around the good ol’ US of A to show off his newest documentary, I Am Battle Comic, the third chapter of his trilogy looking at the lives and careers, and the hopes and dreams, as well as the pain and suffering, of comedians. The first was I Am Comic which, you might recall from just a couple of episodes ago, focused on the efforts of our guest Ritch Shydner trying to re-ignite what had once been a pretty successful standup comedy career. The followup to that was I Am Road Comic, about the trials and tribulations of a comedian working the road today. That film featured another triple visit guest, Wayne Federman. You can likely guess the focus of his new film, I Am Battle Comic – it’s about stand-up comedians who muster up the courage to head into some of the gnarliest war zones that our men and women of the Armed Forces are stationed. The only reason to do so is to bring a few laughs into the lives of the servicemen and women in these god-forsaken hellholes, some of whom are stationed away from home for many months or even years at a time. 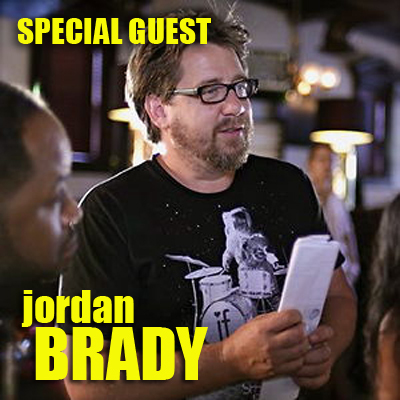 The movie isn’t available for download yet – Jordan talks about when you can expect that in our interview – but he is traveling around, renting out theaters in different places around the country and showing. He often has one or more of the comedians featured in the film with him, too. In addition to Jordan Brady, we’ve got a double dose of our Burst O’ Durst with our resident political wonk & cultural observer Will Durst coming up in this episode. We also say goodbye to comedian Don Rickles, who passed away this week at the of 90, and play a bit from his 1969 album Don Rickles Speaks! This episode is brought to you by Henderson's Pants and their seasonal Spring Breakers. This show marks Succotash's 6th year of soundcasting — 150 episodes — and I want to thank you for your support. But as the world of soundcasting grows ever larger, your support is more important than ever. 5-star ratings iTunes rating, for instance, make a big difference in visibility for the show, and your glowing reviews make me wriggle like a happy puppy. We have never had a real paying sponsor for Succotash in the half-dozen years we've been going. A number of you, fortunately, have made use of the Donate button on our homesite. Or shopped on Amazon via the banner at the top of that very same homesite. Or some have even, in a few cases, purched some merch from the Succotashery. But financial support has come mostly from my own wallet. Operational costs aren't much — $30 bucks a month for web hosting, another $30 every month for publicity, then the odd purchase of promotional merch. Still, it adds up and I hope that if you enjoy listening to Succotash as much as I enjoy putting it out there, that you might feel right ponying up a few sheckels to help pull this thing together.